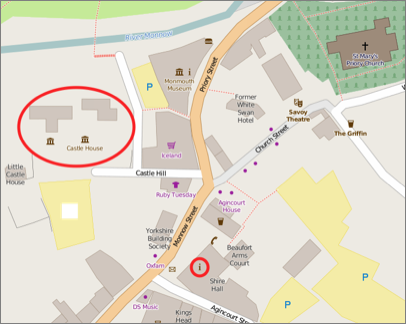 The Museum is by the Castle Ruins - at the highest point of the town centre. From the Shire Hall in Agincourt Square climb the lane beside Iceland. The nearest public car park is at Glendower Street. The approach lane is moderately steep - but wheelchairs can move freely inside the Museum. There are numerous cafes and restaurants in the town - and the Nelson Museum is in Priory Street.